Seminary Grads Give Schools all "D"s.
“I’m going to need new clothes,” my daughter warns me. “It’s just a weekend trip,” I remind her. “I mean, if I go to college there. If I do, then I’ll need a whole new winter wardrobe,” she says trying to demonstrate how reasonable she is being. I have to concede her point. My eighteen-year-old soon-to-be college freshman is looking at two different schools that are in very different climates than the southern California beach city that she grew up in. One in the Pacific Northwest, one in the upper Northeast. Both mean winters with lots of snow. Her stylish t-shirts and hoodie sweatshirts aren’t going to cut it, I know, and she is already planning the shopping spree. It is a reasonable, even necessary reality. She is going to need a winter coat, at least. And even tightwad Dad knows that. But my daughter is also looking only at universities that support women in Christian leadership. And somewhere amidst the discussion of coats is a more important one about collaboration and the time of leadership needed in these harsher conditions of a rapidly changing, post-Christendom world. 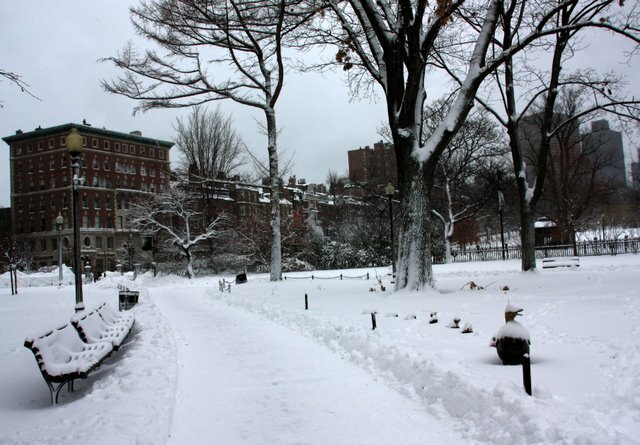 Boston Public Garden Snowfall, by Bill Ilott. Flickr Commons. Harvard Leadership guru Ronald Heifetz compares a winter coat with the need for partners in trying to survive the “harsh elements” of leadership. For Heifetz, leading alone is as foolish as my daughter trying to make it through a Boston winter wearing beach apparel. But we do it all the time, don’t we? When Size Really Doesn’t Matter…. OR… Why a discussion of either “Wee Kirks” or “Tall Steeples” completely misses the moment. One was the pastor of a declining church, the other a growing one. One was in an urban setting, the other rural. One of their churches was well -known, even iconic, the other was church that is not really known outside its community. Both pastors are in their late thirties. Both gifted preachers, caring people, have a strong presence and have good track records. They also share a common theological tradition. One of them pastors a church whose membership is in the thousands, the other (the growing church no less!) has a membership of about 150. For years, the wise assumption was that there is a significant difference between large and small churches. While both require strong preaching, teaching, Session moderating, and pastoral care skills, the management complexity between the large church and the small one called for different skills and experience. Indeed, for a long time size has been considered the biggest difference in different calls. It’s one of the reasons why most ‘first calls’ that are not associate pastor positions are in smaller congregations. It is assumed that as pastors gain experience they can ‘handle’ a bigger job. But as my two conversation partners reminded me, (and I have now had this conversation with dozens of pastors) there is one critical arena of ministry where size doesn’t really matter: leading change. When the topic turns from being a good steward of what a church is and has been to leading a congregation to what they are called to be and become, the leadership skills are the same regardless of size: Instilling urgency, capturing the opportunity, stirring hope, raising competing values, working through resistance, dealing with loss, maintaining conviction in the face of resistance, even calmly addressing sabotage. For the church leaders of the future, the demarcation lines will not be between ‘Mega’ and ‘Wee’ churches (and all those in-between) but between those who are in “management mode” and those who are going through organizational and missional transformation. Regardless of setting, regardless of size, regardless if the church is in 'redevelopment' or is even a "new church developlent." More and more, there will be two sets of pastors, both needed, both invaluable--both will require strong pastoral skills, a love for people and a devotion to Christ.--but more and more there will be two two different sets of tasks with two different callings, requiring a different set of pastoral skills: Stewardship or Leadership. "What do we really want to be?" Is this a season of settling down or setting off for a new horizon? Are we looking for someone to be a steward of our legacy or to equip us for a changing world? Do we really want someone to care for the shareholder saints or are we really ready to reach beyond the walls? Is it a season for managing what we have been entrusted with or leading us in the painful work of being transformed for the unknown in front of us? If the key issue is about management, then size of the congregation (and the staff, the budget, the debt, the facilities, etc.) and the experience of the pastoral candidates is significant to consider. But whether it is a larger church that is addressing decline, or a smaller church that is losing its cozy family feel as they welcome new people; whether it be a dying church looking for a new day or a healthy church looking to bring the gospel to the unreached, disaffected or disinterested, the common pastoral skill set for a changing world is the capacity to lead change amidst the emotional complexity that is part of every church. And when leading change-- size really doesn't matter.